Was with Piedmont Airlines. Was also head of the Pilot Union. Carl Anderson was his Instructor. He had Basic at Sumter, S.C. and Advanced at Turner Field, Ga. He went to the Ferry Command (A.T.C.) at Nashville, TN. He flew A-35’s, C-4’s, B-24’s and P-47’s among many others. Later he flew 90 missions over the “Hump”. He was awarded the D.F.C. with a Cluster, and was discharged in Oct 1945 as a Captain. He was in the Ferry Command. Later the Air Transport Command, flying from Miami to Africa and return. He was disharged in 1946. Came to Douglas from Forman College in South Carolina. Stanton was his instructor. He became a bombardier with the Class of 43-13 at Big Spring AAFd on September 16. He was a graduate of 42I S/N: O-792394. He was a member of the 52nd Fighter Grp, 5th Fighter Sqdn and was MIA and later declared dead after being shot-down in a Spitfire on December 29, 1943. He was based in North Africa and was flying over Italy. Although he was an ordained minister, he enlisted for the air force right after Pearl Harbor. Was sent to Maxwell Field after Christmas 1941. Then sent to Douglas, followed by Shaw Field, Sumter, SC. Then to Napier Field, Dothan, AL for advanced training. Married Mary Lorentz on graduation day. After graduating, he stayed at Napier Field as a flight instructor until he received orders to go to Europe in 1944. He arrived in St. Dizier in October, 1944 to join the 511th Fighter Squadron. Flew 62 missions before May 1945. Hess and his wife continued to try to raise money for the orphans, and when Hess wrote his autobiography, Battle Hymn, in 1956, attention was given to the cause, and a movie with Rock Hudson as Hess was made. Some have criticized the book and movie as not giving credit to Chaplain (Colonel) Russell L. Blaisdell, Air Chaplain for Fifth Air Force in Korea, and S/Sgt. Merle Y. “Mike” Strang, Chaplain’s Assistant to Blaisdell, who sought out starving and bare orphans and began providing food, clothing and shelter and who worked to evacuate the orphans. However, it is clear that Hess donated all proceeds of his book and movie rights to the orphanage and remained involved in its support. He raised money by speaking engagements and starting a nonprofit to assist war orphans. Born 06 Dec 1917; Died Mar. 2, 2015. Dudley Reed was his instructor at Douglas. He had Basic at Shaw Fld, SC and Advanced at Turner Field, Ga. S/N: O-791937. He went into the A.T.C. and flew many ferrying trips across the Atlantic between Brazil and Dakar. Later he was an Over Water Crew Instructor. Later he had a flight service at Ft. Lauderdale. Click here for his bio (a PDF). See him in a group picture at Douglas. WWII LT, later Lt. Col.
Goodman was his instructor. He had Basic at Shaw Field, SC. He graduated from Spence Field, GA. O-361635 Soon was in the SW Pacific flying P-39’s with the 41st Squadron. He flew 276 missions in P-39’s and later the P-47. Click here for his letter about his service (a PDF). Probably in class 42H, but not for certain. S/N: O-792349. He was in the 418th Squadron of the 100th Bomb Group, at Thorpe Abbotts in England. In September 1944 his plane was shot down and broke his arm and nose. He was rescued by the Free French and returned to duty. 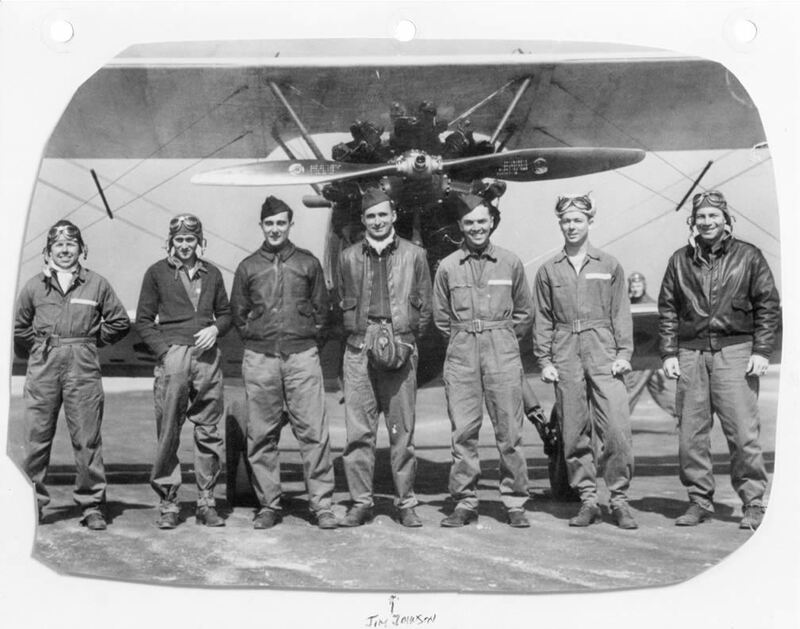 After 25 missions he and his crew were entitled to go back to the U.S., but Rosenthal volunteered to fly more missions. On his 52nd mission, his last, he led a mission to bomb Berlin. Although his B-17 was in flames from a direct hit, he continued to the target to drop his bombs. He and the crew had bailed out. He was recovered by the Russians just outside of Berlin. He made his way back to England by way of Poland, Moscow, Kiev, Tehran, Cairo, Greece and Naples. For more information, click here. He was a graduate of Turner Field 42J, S/N: O-793385. He was a member of the 2nd Ferrying Group 12th Ferrying Squadron and on the 17th of December 1942, he was killed in a mid-air collision near Greenville, Tennessee while flying a Fairchild PT-19A. He had Basic at Macon and Advanced at Moody, GA. He served with the 394th Bomb Grp 585th Bomb Sqdn and was Wounded in Action on April 22, 1944. He was a graduate of Moody Field 42H. Stanton was his instructor. S/N: O-792415. He was a B-25 pilot with the 340th Bomb Group 486th Bomb Squadron. He completed his tour in Corsica and then flew a second tour as a P-38 pilot with the 474th Fighter Group, 430th Fighter Squadron in Europe. Previously lived in Ohio and North Carolina.